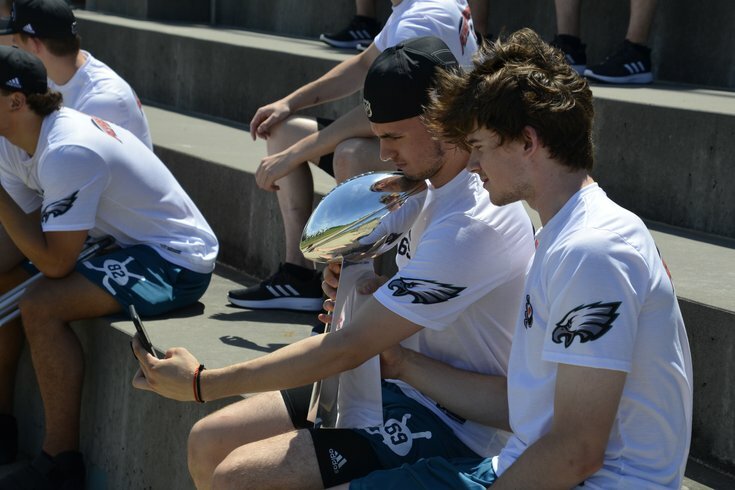 Flyers prospects Carter Hart and Matej Tomek takie a selfie with the Eagles' Super Bowl trophy during a visit to the NovaCare Complex. At the hub of the jutting digital recorders, TV cameras and cell phones, stood Carter Hart, his reddish-brown hair still moist with sweat, answering questions from a media horde on the first day of the Flyers’ five-day developmental camp with the savvy of a 10-year NHL veteran. Spend any significant time with Hart and you quickly lose track that he’s just 19 — and won’t turn 20 until Aug. 13. The next superstar on the Philadelphia sports landscape carries no airs about himself. He doesn’t pound his chest and announce his presence in a room. That’s just not part of Hart’s makeup. What is going to ingratiate Hart even more to the hardscrabble Philadelphia sports fans is his unflappable demeanor and humility. He’s 19 going on 28. This weekend, there has been more media to the Flyers’ developmental camp, being run out of their Skate Zone facility in Voorhees, New Jersey, in more than a decade. A big reason: Carter Hart. After making history this past season by becoming the first goaltender to win the Canadian Hockey League’s Goaltender of the Year award a second time, Hart’s next step is the NHL and possibly starting for the Flyers this October. “It doesn’t mean anything,” Hart said. “I have to stay true to who I am, and for me, coming up to camp in September, it’s still three months away, I have to worry where I am now, and that’s training. I haven’t done anything yet. “My total focus has to be on making the NHL next year. I train because I want to be the best, and I train to make it. I want to play in the National Hockey League and my focus is on my development and my training. The camp has gone well, and I think what’s really helped me deal with [the media attention here in Philadelphia] is playing in world juniors for Team Canada. “The pedestal that’s put on is pretty high, where every move you make, social media covers it. It’s the same here at this level. The other stuff [media attention] I don’t really worry about. Coming into next year, there is a lot of stuff that I need to work on to become better. I need to get bigger, stronger and faster for next season. At the NHL level, everyone is bigger, stronger and faster. I still have work to do. It also builds leaders. One leader emerging with this young group is 6-foot-5, 220-pound defenseman Phil Myers, and the other is Hart, who in 2017-18 led the Western Hockey League in goals-against average (1.60), save percentage (.947) and shutouts (seven)—and those figures came after Hart missed almost a month of the season with mononucleosis and an additional two weeks leading Canada to the world juniors championship. Hart’s roommate during camp is promising goalie prospect Matej Tomek, who’s known Hart for three years. “I love Carter, everyone loves him, we clicked immediately like brothers,” said Tomek, 21, who will most likely be playing in the fall for the University of Nebraska-Omaha. “In hockey, everyone is humble. I think what really separates the really excellent players from the superstars, the high character guys make it farther, because people want to help them, and people want to play with them. Everyone is willing to follow them. As for Hart, he’ll wait to be placed on the Philadelphia sports pantheon with Carson Wentz (25 years old), Joel Embiid (24) and Rhys Hoskins (24). “I really don’t worry about any of that,” Hart said. “Other people can talk about ‘the star stuff.’ I just want to make the team and that’s it. That’s my goal. I have a lot of training ahead of me. This is my first time on the ice this week in about three weeks. Everything is getting back to normal, and all of the experiences I’ve had this past year, in the WHL, at the world juniors, have been a positive impact on and off the ice as to who I am as a person and as a player.